The Polish Air Force was ordered into existence as early as November 1918. Initially it flew a motley collection of everything capable of getting airborne, though after the 1920 Bolshevik War most of the obsolete aeroplanes were worn out, and it started to standardise on mostly French equipment, later to be phased out by indigenous types. The armament of these imports were mostly Vickers Class E fixed, Class F flexible and/or Lewis flexible guns, all chambered for the .303-in. round, imported from France (dates as late as 1929 were found here). As the Polish arms industry was setting up, work begun on standardising the aerial armament with the ground guns in calibre at least (the Army having adopted the German 7.92x57 round). The re-calibration didn't improved matters much, as the Vickers were mostly old and worn out, needing rest badly. They were plagued by frequent jams and parts breakages, as they were not suited for the harder recoil experienced with the more powerful 7.92 mm ammunition. After the Army adopted the water-cooled belt-fed Browning MMG, the Air Force HQ quickly followed suit. In November 1931 the PWU-FK (Fabryka Karabinów, or Rifle Factory in Warsaw) received an order for a new aerial machine gun, based on the wz.30 Polish Army Browning MG. The first of such guns, the "karabin maszynowy pilota wz.33" or "MG, aerial, fixed, fitted for synchronisation, model of 1933" was designed by Boleslaw Jurek of the FK (later to design the Polish 20 mm cannon). It was a recoil-operated air-cooled weapon, fed from the left side with the disintegrating link belt copied from the Vickers E belt, with an overall length of 1000 mm, a 605 mm long barrel, weighing 11,5 kg and capable of rate of fire of around 1000 rpm. The left-side feed allowed for a side-opening feed cover, pivoting to the right - most aircraft of this era carried fuselage guns, thus overhead space was at a premium. The gun worked remarkably well from the start, despite problems with bolt heat treating, to be rectified in 1934 in a new "wz.33A" model. In 1933 an attempt was made to built a flexible gun based on the wz.33. A prototype fitted with many duraluminium parts was made ready in 1934, designated the "wz.34" and even tested, but it proved to be a failure and was soon rejected. Then in 1934 along with the 33A, a new fixed weapon designed by Wawrzyniec Lewandowski, another to carry the "wz.34" designator, was introduced. It was faster-firing at 1,200 rpm, and was the first Polish gun to have alternative feed direction. Both "wz.34" MGs were found wanting and rejected. After two more years the improved fixed "wz.34" became a new standard weapon of the Polish Air Force, now designated as the "lotniczy karabin maszynowy wz.36". It was a multi-purpose gun, being made in many variants, including two fixed guns, the "lotniczy karabin maszynowy pilota wz.36" (km lot wz. 36N), or "MG, aerial, fixed, fitted for synchronisation, model of 1936" and the "lotniczy karabin maszynowy skrzydlowy wz.36" (km lot wz.36S) or "MG, aerial, fixed, wing-mounted, (not fitted for synchronisation), model of 1936". Both were alternative feed weapons, i.e. could be fed from left or right after simply reversing the feed arm. The feed cover pivoted to the front, as the one on the ground gun. Both variants could be made in upper trigger mechanism (36SG, 36NG) and lower trigger mechanism (36SD, 36ND) variations, with mechanical or pneumatic trigger and reloading rigs. A separate variation was the "km lot wz.36G", a fixed gun, fitted for synchronisation with a three-bladed propeller, introduced in 1938. A flexible variation, called "lotniczy karabin maszynowy obserwatora wz.36" (km lot wz.36R) or "MG, aerial, flexible, model of 1936" was also made, but the Polish Air Force rejected it, choosing instead the magazine fed wz.37 observer's gun, based on the BAR. The only wz.36Rs were therefore made for export. Fifty-six of these are known to have been made for the Bulgarian contract PZL-43B support aircraft (light bombers). These were chambered for 7.92x57 despite the Bulgarian Army standard round being 8x56R Mannlicher M30. Sixty of the fixed wz.36G version (fitted for synchronisation with a three-bladed propeller and called the FK 36B) were also supplied to Bulgaria for these aircrafts, again chambered for the Mauser round. One million 7x57mm rounds in "S lot" variation were sold with the weapons. Another export variation of the fixed wz.36G, the FK 36Y, made for Yugoslavia, also chambered the 7.92x57. Table of production quantities and military purchases of the wz.33, wz.33A and wz.36 aerial MGs (export excluded). long hailed as a good starting point for further work on machine guns. It is relatively simple and reliable, capable of working fast, in fact, much faster than needed for ground use. Despite that, of all BAR-related weapons, only the Polish wz.37 and the helicopter-borne versions of the FN MAG ever took to the air. The wz.37, designed by Wawrzyniec Lewandowski from PWU-FK in Warsaw was a gas operated weapon, fed from the 91 rd pan magazine, fitted with a single spade grip integrated with a trigger guard on top of it, much like in the Vickers K-Class or VGO. It was a 7.92x57 weapon, had an overall length of 1080 mm, with a 611 mm long barrel, weighed in at 7 kg and was capable of a rate of fire in the vicinity of 1100 rpm. The wz. 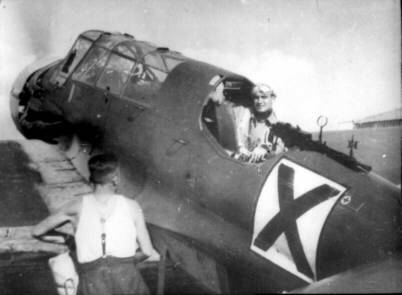 37s were used as observer's guns in the most modern of the Polish Air Force aircraft: the PZL 37B Los medium bomber, the LWS-3 Mewa air-to-ground coordination aircraft (something along the lines of a Westland Lysander, even with wheel-spat mounted wz.36 Brownings) and the PZL 46 Sum light bomber. The 7.92 mm guns were more and more obsolete in late 1930s. The Polish Army had heavier automatic weapons, these being the French 13.2x99 Mle 30 Hotchkiss, but there was also concern that they would soon become obsolete, so a 20 mm weapon was sought by both ground forces and the AF. The first take at the 20 mm cannon was a make-shift "najciezszy karabin maszynowy Model A", or the heavy machine gun model A, introduced in 1938 as a "20 mm M1938 HMG". It was a recoil operated weapon with an original breech mechanism, designed by Bronislaw Jurek, and was chambered for the 20x138B Solothurn round which the Polish authorities deemed the most desirable of all foreign 20 mm rounds tested so far. The Mod A was acceptable for a front-line AA/AT gun, but much too heavy for carrying aloft and the recoil would jarr the delicate airframe too much. A universal army/navy/air force cannon had to be devised, if the 20 mm cannon were to be in place in time for the impending conflict. The Mod B gas-operated model proved to be an utter failure. Mod C was meant to be the most universal type of the entire wz. 38 HMG family. It was a weapon designed with the experience gained during the A and D cannon trials, completely re-designed, to make a perfect, universal weapon for both the Army and Air Force. The gun was designed by S. Rytwinski and W. Lewandowski. Trials of the first prototype were scheduled for October 1938, but the KZU ordered two more guns already in September, paying Zl 47.747 (then 1$=5.14 Zloty, which is a Polish currency) a piece. The trial results are unknown, but the mod C wasn't mentioned again. The gun was to serve as a belt-fed aircraft cannon or with magazine feed and lighter barrel, as a ground AT weapon on a light mount or, finally, as a belt or magazine-fed AA gun on heavy PC 20A mount, derived from the 37 mm Bofors cannon carriage. Mod C was a gas-operated weapon. It's action was patterned after the Hispano-Suiza. Rate of fire could be adjusted by means of a gas regulator. Feeding of the Mod C was to be by 5 or 10 rd box magazines, 100 rd drum magazine or belt-fed with the disintegrating 200 rd belt. The field stripping was very easy and needed no complicated tools. The gun in it's ground rôle could be easily dismantled for carrying by unlatching and turning the barrel by 60 deg, thus removing it. Aware that the mod A was only a makeshift design, as it could not be universal, Mr. Jurek set to work on another HMG, this time gas-operated, referred to as Mod D. Despite the different way it operated, many components were interchangeable with the recoil-operated Mod A. The prototype was ready in May 1938. The trials gave satisfactory results and the KZU ordered 2 more guns for evaluation with delivery scheduled for April 10, 1939. Before these were ready, two more were ordered on Feb 24, 1939 for Zl 41,998 a piece with delivery by July 1, 1939. The mod D was designed as an aircraft weapon, but due to the failure of universal mod C, changes were incorporated as to enable it to be the universal weapon, for air, land and sea service. The Air Force planned to fit them into the newly designed modern (low-wing, retractable undercarriage, enclosed cockpit) PZL P 50 Jastrzab fighter and a twin-engine P 48 Lampart heavy fighter as well as the P 49 Mis medium bomber. The mod D was a gas-operated weapon, with gas-regulated rate of fire, fed from various magazines or a belt. rate of fire: variable from 300 to 600 rpm. Not even a single 20 mm Polish cannon took to the air to defend Poland in 1939. The only combat-proven Polish 20 mm were the Mod A recoil-operated guns mounted in TKS tankettes, and these proved excellent for AT work. The Mod D gun was not ready for production by 1939, when the war started. Simultanously with the gun tests, ammunition trials were conducted, and the Solothurn 20x138B mm round was selected as the best type of ammunition to base the indigenous design on. State Powder Plant in Pionki was ordered to work up a special powder and explosives for the Polish shells. The production of the 20 mm ammunition begun in September 1938. The rounds were assembled in Skarzysko, with PWU-FA made (of 72% Cu Swiss Dornach brass) cases, and Pionki made powders and projectiles. The PWU-FA, due to overburdening with small arms ammunition orders, had very long delivery terms and a low output of the 20 mm, too low for the hundreds of HMGs ordered. This called for an immediate and effective remedy. On Sept 1, 1939 the PAF had 164 fighter planes armed with wz.33, wz.33A and wz.36 fixed guns, of which 119 were the most modern (though four years old and obsolete compared with the Bf 109) gull-winged, open-cockpit, fixed wheeled PZL P11Cs. Only 10% of these were fitted with 4 MGs (two fuselage guns, synchronised, mechanically fired and reloaded, and two wing mounted ones, not synchronised, pneumatically fired and reloaded). Fifteen were the PZL P11As and thirty were the older variant, the PZL P7As, armed mostly with re-chambered 7.9x57 Vickers Class E MGs, though some of these were re-armed with wz.33As during overhauls. All fighters used in 1939 were of indigenous Polish design and made in Warsaw by a state-owned company, called the PZL for Polish Air Works. The so-called "4-MG" P11C carried 2200 rds of 7.9x57 ammo in S-lot (S light ball, "lot" meaning "lotniczy", or aerial use, being a top quality ammunition for aerial synchronised guns, similar to the Red Label 4-digit .303-in. ), PS-lot (AP-Tracer for aerial use), P-lot (AP for aerial use) and Z-lot (Incendiary for aerial use), belted in three mixes. For peacetime practice a 4 S-lot to 1 PS-lot mix was recommended. For wartime, while the supplies are plentiful, 1 PS-lot to 1 Z-lot or 1 P-lot, 1 PS-lot, 1 Z-lot mixes were recommended. With shortages this was allowed to be mixed with ball S-lot, but not less than 1 Z-lot and 1 PS-lot every 5 S-lot rounds. For kite balloon shooting a special mix of 3 Z-lots to 1 PS-lot was recommended. The 2-MG variation of the P-11C fighter carried up to 1400 rds. The weight of the armament was: 82 kg (180.6 lbs) for two wing MGs complete with trigger and reloading rigs plus ammunition, and 79 kg (174 lbs) for two fuselage MGs complete with trigger, synchronisation & reloading rigs plus ammunition. The PAF claim to have shot down during a three-week air combat over Poland a total of 147 German and one Polish (a PZL 23B light bomber mistaken for a Stuka due to similar landing gear fairing arrangement) aircraft, of these 10 were Bf 109s, 13 Bf 110s, 10 Ju 86s, 17 Ju 87 Stukas, 30 Do 17s, 44 He 111s, 15 Hs 126s, 1 He 45 and 7 unidentified. German sources state 283 aircraft were lost due to the PAF, flak and accidents, but offer no further details as to how each plane was lost. The PAF lost 118 fighter planes, of these 32 were to German fighters, 10 to bomber crews, 7 each to both German and Polish flak, 4 on airfields to bombing raids, and 58 lost due to accidents, destroyed by the ground crews due to lack of fuel and spare parts, overrun at the fields by the enemy ground troops etc. After the Sept 17, 1939 USSR invasion, the PAF also fought the Soviet Air Force. Six Soviet aircraft were shot down, of these two were SB-2 medium bombers, two I-153 Chaika fighters, one I-16 Rata fighter and one R-5 recce aircraft, together with one I-153 fighter damaged beyond repair, before on September 19, 1939 fighting the Bolsheviks was forbidden unless in self-defence. No data is available on the losses of the PAF due to Soviet AF. Many Polish airmen managed to get to France, and then to Great Britain, where they joined the RAF in it's Battle Of Britain. 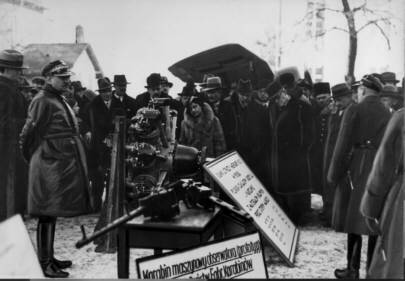 br33pl1: The only known photograph of the experimental wz.34 observer's MG, here seen at the exhibition of Polish armaments industry in Warsaw, held in January 1935 for the Senate members. A wz.33 fixed MG accompanies the prototype wz.34. Note P-7 fighter plane in the background. 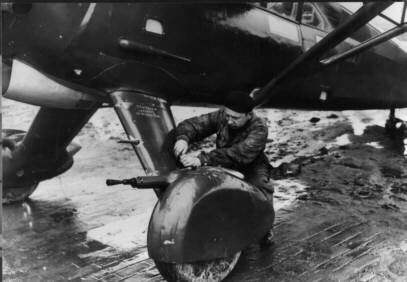 br36pl1: Ground crew working on the wz.36SG fixed MG, mounted in wheel spat of the LWS-3 Mewa observation aircraft / light bomber. Only few prototype LWS-3s were ready in 1939, and due to absolute German air superiority were denied chance to show their mettle. br36blg1: A very rare shot of the Polish-made Bulgarian PZL-43B Czajka light bombers, the only Polish aircraft to carry fully uniform armament of four Browning wz.36s - two fixed, synchronised for the three-blade propeller FK 36Bs (wz.36G), and two wz.36Rs in rear gunners positions, upper of which is shown.